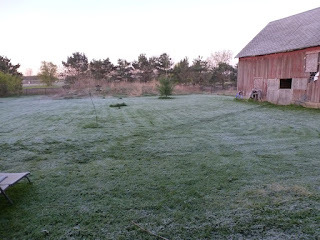 On Friday morning I was walking around the place, photographing the widespread frost. It's pretty while it's frozen. The danger comes when the frost melts. Have the cells burst, will the tissue turn to mush as it warms? This part of my property is wide open to the weather. I wondered how the front garden, enclosed in a privacy fence, had fared. I called Ulani and we went through the house to the other side. The front is where the Oskar memorial tree is planted, as well as a huge old maple tree, and related shade garden. I suppose due to the tall fence, no frost covered the grass there. The birds sang loudly and I decided to sit down with my coffee for a few peaceful minutes. As I sat back, Ulani made the rounds, investigating each tulip, Lenten rose and blade of grass. Then suddenly I sensed her tense up. 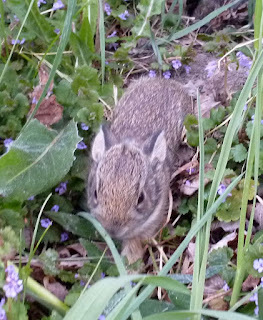 I looked over to see her at the base of the maple tree sniffing heavily, then she began digging. And then I saw them scatter. 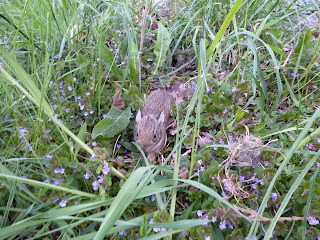 Two of them raced out of the nest into the grass and froze. The third was not so lucky. Ulani caught it. Now I must digress a moment. Rabbits are a scourge here. They devastate leafy greens in the garden. And they are not bright. 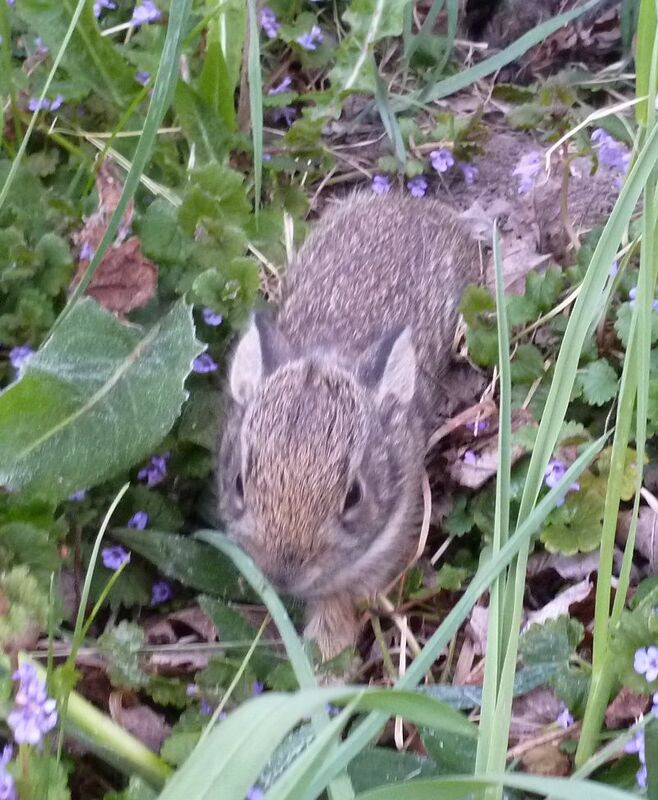 We rarely see a squirrel, but this time of year the rabbits make their shallow grass nests everywhere, and that old expression that I won't put here in case of young readers must be true! 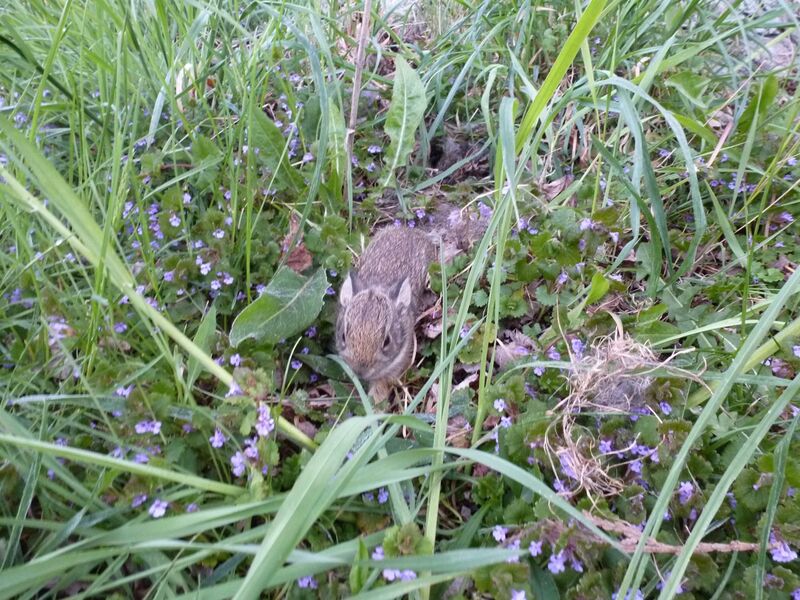 Every year some stupid bunny makes its nest inside the dog fence, sacrificing its young to the Great Huntress Ulani. Every year! You might remember my birthday a couple of years ago. So Ulani has a strong history of reinforcement in catching rabbits. So back to Friday morning. I jumped from my peaceful chair yelling "drop it! Drop it!" Predictably, she did not. I raced over to her, and with only a moment's pause I grabbed her snout, squeezing her cheeks and saying "Drop It!" She did. (Squeezing the cheeks kind of forces the jaws open. I don't think this was compliant behavior.) Then I grabbed Ulani's collar and pulled her into the house. Now what to do about the bunnies? I decided to scoop them up and return them to the nest area. But I had no gloves or boxes nearby, so I just used my hands. The poor buns used their only defense. They stayed perfectly still. Basically useless once you see them. I gathered them up, placed them at the base of the tree, then took the unlucky one out to a final resting place under a bush, near a tulip, where The Great Huntress does not go. So on this Easter morning, say a little prayer that your Easter Bunny goes to your house first. Because he'll never get away from Busy Solitude Farm. Awww! The great Easter Bunny bless your soft heart! well, that's why I don't encourage birds in my yard....cats. April 1 Garden Bounty - No Fooling!